The Midtown Arts District of Miami is growing rapidly and is now home to some of the most elegant and high-end luxury living experiences in all of Miami. The “Magic City”, as it has been referred to, is so magic because of iconic buildings like 1800 Biscayne Plaza. This 22-story luxury condominium is home to 150 beautiful luxury residences with dozens now available for sale or rent. Two, three, and four bedroom floorplans are now available, and range in size from 1,051 square feet to 2,287 square feet. Pricing for two bedroom, one bathroom units starts at just $299k and larger four bedroom floor plans go for just $849k. Located on US-1 Federal HIghway, 1800 Biscayne Plaza is in the heart of Miami and offers beautiful city and Intercostal Waterway views. 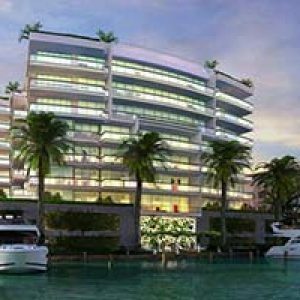 Built in 2005, 1800 Biscayne Plaza luxury condominiums in Miami has contributed to the magic in Magic City but are still new enough to handle the complexities of the modern world. Every residence at 1800 Biscayne Plaza come with outdoor living space to take full advantage of the beautiful vistas outside. Glass doors provide a seamless transition between open indoor floor space and outdoor living areas. Kitchens come standard with granite countertops, European-style cabinets, and modern name brand appliances. Ceramic floors are ideal for maximizing natural light as well as keeping your luxury residence clean and sparkling. A breakfast bar is a great place to dine or gather friends, as the kitchen is often the most social room in a house. Every bathroom features marble vanities, large mirrors, and exquisite lighting. In addition to the magic inside at 1800 Biscayne Plaza luxury condominiums, every community member is free to enjoy the countless high-end amenities. A large swimming pool and jacuzzi are open all day, a great place to swim, relax, lounge, or tan on the pool deck. Ensure that your family and property are safe with 24-hour security and covered assigned parking. A beautiful entry hall will be sure to impress your guests in addition to the multimedia theatre and social room. The entire building is pre-wired for high-speed internet and smart home technology. Work out in the state-of-the-art fitness center, or get some work done in the business center, complete with computers, printers, fax machines, and more. They don’t call the Midtown Arts District the “Magic City” for nothing, and living at 1800 Biscayne Plaza will exemplify this name. In the heart of a bustling business district, 1800 Biscayne Plaza is also nestled in between Margaret Pace and Biscayne Park, both ideal for pets, bird watching, or taking a relaxing stroll. Catch a show at the Adrienne Arscht Center for the Performing Arts, or check out some iconic Miami artists at Perez Art Museum Miami. The Bayfront Park Amphitheatre and The Shops at Mary Brickell Village are just a few blocks away as well. Experience the magic of “Magic City” with a luxury residence at 1800 Biscayne Plaza!